Angie is our mission in action. 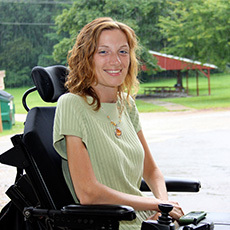 She took full advantage of the resources available to her at Easter Seals Iowa. Get involved to support our clients and campers! Supported Education is a unique program designed to give participants support and guidance as they develop marketable skills through post-secondary education. Participants are provided with ongoing support throughout the semester with registering for classes, accessing campus resources and communicating with faculty. There is also a one-week skills training available prior to each semester focusing on stress and time management, college expectations and developing natural supports on campus. Supported Education serves adults age 18 and older who are diagnosed with a developmental and/or intellectual disability in Polk and surrounding counties. Apply for this program by completing our Program Application and emailing it to Intake Coordinator Renee Bell at rbell@eastersealsia.org or calling 515-309-1783. Case managers should also send social history, plan and assessment along with the application.